Beginning and ending with the last performance of Vaslav Nijinsky, widely considered one of the greatest dancers of the twentieth century, choreographer John Neumeier’s “biography of the soul” is a contemporary ballet masterpiece. Nijinsky draws its audience in from the beginning. There is no reminder to turn off your cell phone, no dimming of the lights, instead the ballet begins with the arrival of invited guests, accompanied by an onstage pianist. In a Swiss hotel ballroom in 1919, Vaslav Nijinsky, celebrated as “le dieu de la danse”, is about to dance his final public performance before he is diagnosed with schizophrenia and institutionalized. During his performance, Nijinsky hallucinates his former lover and mentor, Serge Diaghilev, in the crowd. Prompted by this appearance, he recalls fragments of his professional career and personal life. Dancers representing Nijinsky’s most memorable roles weave in and out of his memories, but madness threatens to overtake him and he hurtles towards his last dance – the War. Nijinsky would not have the emotional weight that it does without its score. The music is so well-suited to the ballet that if you didn’t know better, you’d swear it had been composed with Nijinsky in mind. Rimsky-Korsokov’s romantic “Schéhérazade” accompanies Nijinsky’s early affair with Diaghilev, marriage to Romola, and the triumphs of his career. The plaintive “Sonata for Viola and Piano” by Shostakovich chronicles the replacement of Nijinsky in Diaghilev’s life, both personally and professionally, by Leonid Massine, while Act II relies on another work by Shostakovich, the foreboding discordant tones of his “Symphony No. 11 (The Year 1905)”. All are performed brilliantly by the National Ballet Orchestra. John Neumeier’s choreography is unlike anything I’ve ever seen before. No filmed footage of Nijinsky performing exists, but Neumeier has used photographs of the dancer in costume to imagine what his style of movement may have looked like, and infused it with his own choreographic touch. An expert on Vaslav Nijinsky, he not only choreographed the ballet, but also designed the sets, costumes, and lighting. The result is breathtaking. Neumeier creates opportunities for brilliant partnering in a rare male pas-de-deux depicting the complicated relationship between Nijinsky and his lover, and in a playful pas-de-trois between Nijinsky, Romola, and the Faun. The choreography is equally adept at showcasing the corps de ballet, who factor heavily into a nightmarish WWI-inspired reimagining of “Le Sacre du printemps”. Neumeier requires dancers in his ballets to also be skilled actors, able to communicate on an emotional level. The depth of emotion conveyed through choreography, gestures, and expressions in Nijinsky make this a ballet that amply rewards audience members who are seated close enough to have a clear view of the dancers’ faces. On opening night, Guillaume Cote displayed the technical ability of a principal dancer in his prime, executing Nijinsky’s difficult early solos with precision. His natural chemistry with real-life partner Heather Ogden (as Nijinsky’s wife Romola) is apparent, but it’s his connection with Evan McKie’s Diaghilev that I felt most keenly. Tall and imposing, McKie brings an aloof superiority to his role as the ballet impresario, and Cote is at his most vulnerable in their scenes together, when the conflicted feelings that Nijinsky has for this man really come through. Guillaume Cote’s take on Nijinsky’s madness has a violence to it, and he depicts the character as a man aware of and struggling against encroaching mental illness. He forcefully pushes Dylan Tedaldi’s Stanislav to the floor in one scene and lashes out at devoted Romola in another. In contrast, Skylar Campbell‘s approach to Nijinsky’s madness is more internal. Particularly in the opening scene of the ballet, Campbell appears to have taken to heart the final words of the synopsis, “In Nijinsky’s eyes, it is the world around him – not Nijinsky that has gone mad.” There is an unaffected innocence to his portrayal, which makes his descent into madness all the more gut-wrenching. Campbell sometimes has an ethereal quality when he dances, and it’s put to good use in the first act, where he is completely believable as a man revered as the “God of the Dance.” Nimble and graceful, Skylar Campbell excels technically, but it’s his acting ability and the depth of emotion he’s able to access that make him so exceptional in this role. Both casts I witnessed were superb, but it’s the Thursday night cast that broke my heart. I found the combination of Campbell’s expressive dancing and the increasingly discordant music in the final scene deeply affecting. Skylar Campbell and Sonia Rodriguez are, if not the most gifted dancer-actors in the company, certainly among them, so their partnership is entrancing. Rodriguez conveys Romola’s utter joy at falling in love with the dancer she so admires, demonstrating a natural chemistry with Campbell that I wish the National Ballet would exploit more often. It’s their Act II duet that brought tears to my eyes though. Romola’s heavy steps, as she pulls the sleigh bearing her husband, reflect the burden of caring for the increasingly further gone Nijinsky. Campbell has touching moments of lucidity interspersed with longer stretches of madness, where his Nijinsky is either manic or catatonic. It’s devastating to watch them lose one another in such a fashion. I was fortunate enough to catch three different Nijinsky-Diaghilev pairings, the most effective of which was Guillaume Cote and Evan McKie on opening night. In fact the pas-de-deux between Cote and McKie was a highlight of the evening for me, second only to Dylan Tedaldi’s reliably excellent performance as Stanislav. I loved the chemistry between Cote and McKie and it was a great pleasure to see a male pas-de-deux between two principal dancers at the top of their game. With Piotr Stanczyk (who I loved as Diaghilev during the ballet’s 2014 run) out due to injury, Ben Rusidin stepped in to partner Skylar Campbell. Rusidin’s youthful features put him at something of a disadvantage; he’s aloof, but lacks the imposing quality and gravitas that McKie and Stancyzk bring to the role. Rusidin dances the role beautifully though, making an impressive debut. A few awkward movements involving Rusidin and the dancers playing the Spirit of the Rose and The Golden Slave early in the ballet were, I assume, due to casting changes and a lack of rehearsal time. Thanks to a last minute casting change at the Saturday matinee, I had the opportunity to see McKie’s Diaghilev opposite Campbell’s Nijinsky. Both are dancers that I love to watch, but I wondered how well they would work together with (one assumes) limited rehearsal time and a height difference to overcome. I shouldn’t have worried. Skylar Campbell’s youthful vulnerability is more pronounced when set against McKie’s calmly superior Diaghilev. This serves to make the fraught dynamic between Nijinsky and Diaghilev all the more interesting to watch, particularly in the pas-de-deux. With a few minor exceptions, their partnership was extremely effective. On opening night, Francesco Gabriele Frola performed two of Nijinsky’s most famous roles, The Golden Slave in “Schéhérazade” and the Faun in “L’Après-midi d’un faune”. Frola is well-suited to both roles, bringing a sensuality and athleticism to The Golden Slave and showcasing his beautiful jumps. As the Faun, he was equally impressive, demonstrating strong partnering in the pas-de-trois with Guillaume Cote and Heather Ogden. The Thursday evening and Saturday matinee performances saw the roles of The Golden Slave and the Faun split between Kota Sato and Felix Paquet. Always an exuberant dancer, Kota Sato was a little overenthusiastic in a surprise debut as The Golden Slave, but settled into the role over the course of the performance. Sato is someone I often find myself watching in the corps de ballet, and has been a standout in smaller roles, so I was thrilled to see him get this opportunity. Felix Paquet was a memorable Faun, working well with Nijinsky and Romola in the pas-de-trois, and partnering Elena Lobsanova’s Karsavina with ease. Both Naoya Ebe and Dylan Tedaldi were a pleasure to watch in their dual roles as the Spirit of the Rose in “Spectre de la Rose” and Harlequin in “Carnaval”. Light and delicate as the Spirit of the Rose, Tedaldi and Ebe seem to hang in the air when they jump. In contrast, both dancers portrayed a playful and dramatic Harlequin. Another of Nijinsky’s memorable roles, Petruschka, is played against type by Evan McKie. McKie portrays the puppet as tender and pitiable, but I preferred Jonathan Renna’s energetic lament for fallen soldiers. 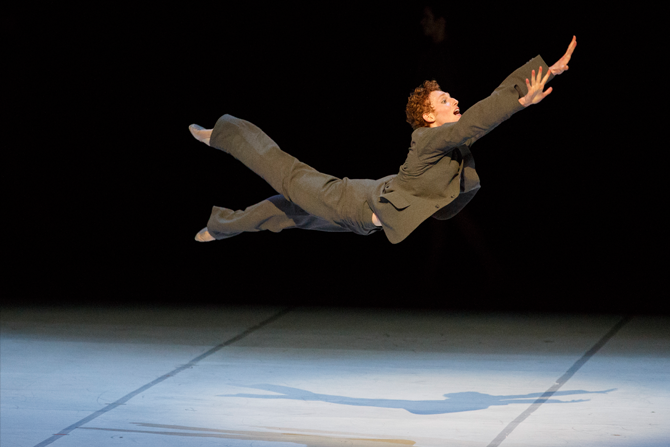 By now Stanislav, Nijinsky’s mentally ill brother, is undoubtedly a signature role for Dylan Tedaldi. Whether I see him dance the powerful Act II solo in World Ballet Day footage, in a studio rehearsal, or live on stage, I never fail to be moved by his performance. He is phenomenal, imbuing the physically demanding role with strength, but also vulnerability. I enjoyed Robert Stephen‘s take on Stanislav, but while Stephen’s acting is solid, some of his movements in the solo were not as cleanly executed as Tedaldi’s. Jenna Savella is strong and precise as Nijinsky’s sister Bronislava, a respected dancer and choreographer in her own right, but Jordana Daumec was a revelation in the role. Daumec is a subtle but effective actress through most of the ballet, but lets loose in an emotional Act II solo. Dancing as the Chosen Maiden in a reimagining of Nijinsky’s infamous ballet “Le Sacre du printemps”, which provoked a riot upon its premiere, she displays a fierce anguish that is utterly captivating. Nijinsky is not for everyone. Classical purists may not be as awestruck by Neumeier’s starkly modern choreography and emotionally intense, quasi-biographical look at Vaslav Nijinsky’s brilliant career and early descent into madness as I was. For those with an open mind though, Nijinsky is a rewarding, emotionally draining, masterpiece that is worthy of being watched again and again.